A few months ago I had lunch with the author of Creating a Missional Culture, we ended up going to eat at a Thai place near my church. Being from East Hollywood, JR Woodward was used to some really good authentic Thai food, so walking into the restaurant we were having lunch at I could tell that he wasn’t expecting much; however he was pleasantly surprised. That’s my experience with this book. “Missional” books have flooded the market, and its no longer easy to tell (by the book’s cover) whether or not the book is going to be good. Anyway I picked this book up, not expecting much; however I was very pleasantly surprised. This is a book written by someone who is not only a theoretician, but a practitioner. He is a church planter, he knows what its like to get a missional church off the ground. He knows what its like to see a church die and to see a church thrive. He knows that a thriving church will e a blessing to the neighborhood it finds itself in. And through all of this he has discovered that “effective church planting requires thinking about the culture of the congregation.” But this book is not only about planting, its about doing church missionally. Church plant’s aren’t the only ones who can do church missionally. However if a church is going to be missional it must understand that “more than a strategy, vision, or plan, the unseen culture of a church powerfully shapes her ability to grow, mature, and live missionally.” Shaping the unseen culture of your church is what this book is all about. This book is broken down into four different parts. Part one is about the “Power of Culture.” In the four chapters in this section JR explains several things, first he explains what missional culture is. Missional culture is more than just programs, its about our ecclesial identity. Its grounded in the fact that mission exists because God is a missionary God. However, to get to a “missional culture” we need to begin by understanding what culture is and how culture is shaped. Woodward lays out six elements of culture that he calls the “cultural web:” 1-Language, 2-Artifacts, 3-Narratives, 4-Rituals, 5-Institutions, and 6-ethics. These six elements make up our culture but they also shape our culture. Culture and culture making is a dynamic back and forth process. Having laid out some basic ground work for culture he asks us to examine the culture of the church we serve in. Is it primarily a learning environment? A healing environment? A welcoming environment? A liberating environment? Or is it a thriving environment? A missional church needs all five. He ends this part with a discussion of polycentric leadership. In essence polycentric leadership is an understanding of leadership in which there is a community of leaders rather than a “center” of leadership. In other words there are many centers of leadership rather than one. JR believes that scripture encourages a polycentric understanding of leadership and he appeals to Ephesians, especially Ephesians 4. Part two is about the type of “Leadership Imagination that Shapes Missional Culture.” He begins by discussion different shifts in attitudes towards leadership over that last 500 years, beginning with the Print Age and moving forward into our current Digital Age. Leadrs in this age are primarily “impartational,” that is they are equippers. He then goes on to study what the Bible says about leadership and concludes that the primary model of leadership in scripture is the model which understands God at the center, and elders around him “leading in the round serving at the periphery to activate the entire people of God.” Finally he goes on to make a Theological case for polycentric, communal, impartational leadership. He concludes this section by giving some practical steps towards embracing this type of leadership over hierarchical leadership. His most important piece of advice towards this end is that the leader needs to be able to relinquish the need to control. Part three, in my opinion, is the heart of the book: “The Five Culture Creators.” Basing this section off Ephesians four, he beings by showing that Jesus embodies all of the Ephesians 4 gifts. Jesus is the Apostle, Prophet, Evangelist, Pastor, Teacher. He is the only human to have all four gifts perfectly, but the Spirit does give people with these gifts to the church. Each of these people are there to move the congregation towards God’s end of having a church that is mature in Christ. JR then spends the rest of this section by explaining the “focal concern” and the “telos” for each of these equippers. For instance the focal concern of the Evangelist is “incarnating the good news” and the Telos is “proclaiming the good news by being witness and being redemptive agents.” The Evangelist equipper helps the community to do these things. These Ephesians 4 gifts, are the gifts that shape the culture of the congregation. The fourth part of this book takes the three previous sections and puts them to work. 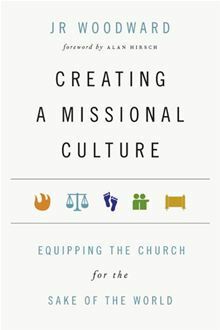 The fourth section is about “Embodying a Missional Culture.” Embodying a missional culture begins by understanding and listening to the community in which the church finds itself. Then the church asks itself “What is God’s calling for our church? What are our core practices? How will we fulfill our calling? What does it mean for us to be faithful? These four questions are just elaborations of the six elements of culture. The church then has to figure out how to live this vision. It must learn how to cultivate missional environments. This is where the Ephesians 4 equippers come in. Apostles cultivate thriving environments, prophets cultivate liberating environments, Evangelists cultivate welcoming environments, Pastors cultivate healing environments, and teachers cultivate learning environments. But they don’t stop there, they don’t only cultivate these environments; they create a culture of equipping where others are equipped to do the same things. These Ephesians 4 “gifts” are people who are player-coaches. They play the game and they coach, but they don’t only coach they have the goal of multiplying leaders. Multiply, Multiply, Multiply! This happens through apprenticeship. But this way of doing church only happens under a polycentric model of leadership. Multiplication cannot occur under hierarchical leadership. So we have taken a look at the overall flow of the book… next time I will present what I think are some of its strengths and weaknesses. I must be upfront and say that this book received an honorable mention on my Top Books of 2012 list, so my opinion is a bit biased. Creating a Missional Culture, 19. Creating a Missional Culture, 87. Please find an introduction to the most extraordinary book published in 2012 via this reference.